25C-NBOMe is a designer substituted phenethylamine and a high-potency psychedelic that acts on the 5-HT2A receptor. Although 25C-NBOMe overdoses have been related to several deaths in the USA and Europe, very limited data exists on the in vitro neurotoxicity of 25C-NBOMe. In this study, we found that 25C-NBOMe potently reduced cell viability of SH-SY5Y, PC12, and SN4741 cells, with IC50 values of 89, 78, and 62 μM, respectively. Methamphetamine decreased the cell viability of these cells with IC50 values at millimolar range in the same tests, indicating that 25C-NBOMe is > 50 times more potent than methamphetamine in its ability to reduce viability of SH-SY5Y cells. 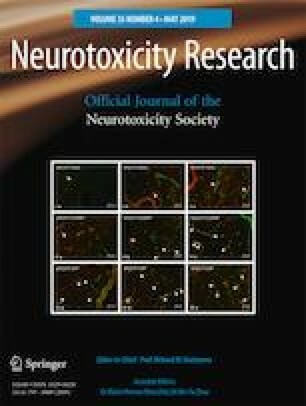 The neurotoxicity of 25C-NBOMe on SH-SY5Y cells was further confirmed by using fluorescein diacetate/propidium iodide double staining. 25C-NBOMe elevated the expression of phosphorylated extracellular signal-regulated kinase (pERK), but decreased the expression of phosphorylated Akt and phosphorylated Ser9- glycogen synthase kinase 3β (GSK3β) in time- and concentration-dependent manners. Interestingly, either specific GSK3β inhibitors or specific mitogen-activated protein kinase kinase (MEK) inhibitors significantly prevented 25C-NBOMe-induced neurotoxicity in SH-SY5Y cells. These results suggest that 25C-NBOMe unexpectedly produced more potent neurotoxicity than methamphetamine and that the inhibition of the Akt pathway and activation of the ERK cascade might be involved in 25C-NBOMe-induced neurotoxicity. Most importantly, these findings further inform the toxicity of 25C-NBOMe abuse to the central nervous system for public health. Peng Xu and Qiyang Qiu contributed equally as co-first authors. The online version of this article ( https://doi.org/10.1007/s12640-019-0012-x) contains supplementary material, which is available to authorized users. This work was supported by the National Key Research and Development Program of China (2017YFC0803605), the National Natural Science Foundation of China (81673407, 81870853, 81850410553), Ningbo Sci & Tech Project for Common Wealth (2017C50042), Zhejiang Provincial Key Laboratory of Pathophysiology (201804), Ningbo municipal innovation team of life science and health (2015C110026), LiDakSum Marine Biopharmaceutical Development Fund, and the K. C. Wong Magna Fund in Ningbo University.